CHICAGO, Dec. 4, 2018 /PRNewswire/ -- The Chicago-based Society for Vascular Surgery has announced it will relocate its headquarters to Rosemont, Ill., near Chicago's O'Hare International Airport, as of March 1, 2019. The SVS http://www.vascular.org/ is an international, not-for-profit professional medical society, serving specialty-trained vascular surgeons and allied professionals. The new space is nearly twice the size of the current main office (just north of Chicago's Loop) and will have room for future expansion. The SVS Foundation and the SVS Patient Safety Organization also share SVS' workspace. Additionally, the SVS provides management services for the Association of Program Directors in Vascular Surgery, the Society for Vascular Nursing and the Delaware Valley Vascular Society. 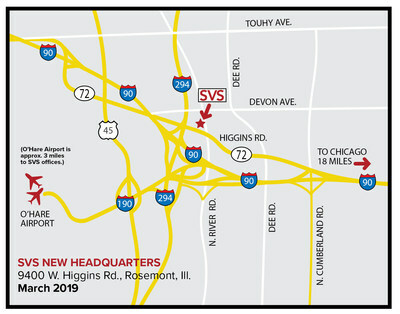 The new SVS headquarters will serve the Society's vascular surgeons across the country and around the world, noted SVS President Dr. Michel S. Makaroun, and its location, 10 minutes from the airport, will be convenient for meeting attendees. It also will allow for additional programming to meet the future needs of vascular surgeons, including ongoing training. "In 10 to 20 years," Dr. Makaroun said, "we will be a different organization because of this space. We will be working collaboratively with vascular societies, medical societies and health organizations in a whole new way as well." "Our new headquarters will help the Society keep pace with the specialty," said Dr. Makaroun. "We are extremely proud of this growth and the leading role our surgeons continue to play in preventing, treating and managing circulatory disease."